Kafsan is investing in order to grow continuously. Kafsan added a new box oven to Machine Park after paint cabin. We process parts up to 5000 kg at maximum dimensions of 7.5 meters in length, 2.5 meters in width and 2.5 meters in height. 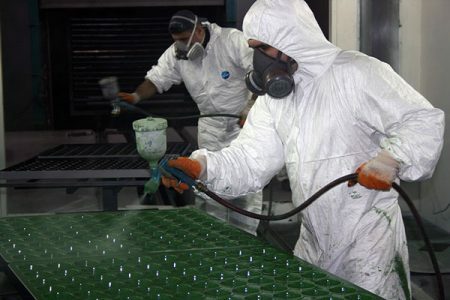 DuPont Teflon® industrial coatings can be used on carbon steel, aluminum stainless steel, steel alloys, brass, and magnesium, as well as non-metallic such as glass, fiberglass, some rubber, and plastics. 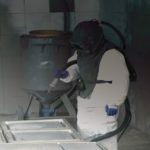 · Removing all surface contaminants (rust, oil, grease, etc.). Pre- baking the piece at the final cure temperature will prevent any oil. · Measuring viscosity of the product and if it is proper placing it in a gun. 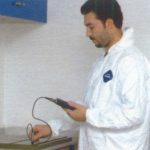 · Curing at temperatures from 150°C to 420 °C under computer controlled temperature-curing curve. 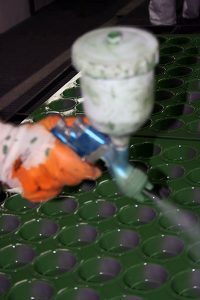 · Measuring of applied coat thickness (5µ to 1000µ) and hardness.